Seven years ago, Krista Berlincourt stepped out of the office, walked to her car, sat down and hoped for divine inspiration. She had just gotten off the phone with a New York Times reporter, one of 87 calls she’d received from every major news outlet over a 48-hour window. Her company was in the midst of a firestorm, as the personal data of an estimated 800,000 customers had vanished on their smartphones. At the time, it was described as “the biggest disaster yet for the whole concept of cloud computing” and is still one of the largest mobile data outages in history. She was the last to leave that day, as the media waited for her response. The incident forever shaped Berlincourt’s philosophy in responding to what she refers to as “brand threats,” the moments of alarm that have the potential to throw a company into a tailspin. 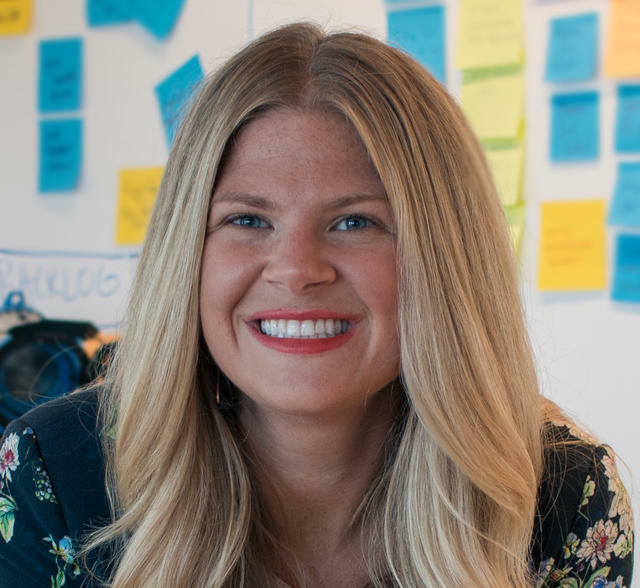 She’s now the Head of Communications at fintech company Simple. Before that, she drove Developer and App communications for Microsoft’s Windows Phone after a stint supporting the company’s Startup Business Group. Today, Berlincourt actively advises startups with their communications strategy, most recently the Jaguar Land Rover Tech Incubator and previously companies participating in the Nike+ TechStars Accelerator. In this exclusive interview, Berlincourt shares the principles and practices she’s honed over the years to help her navigate painful pinches in even the most highly regulated consumer industries. Here, she not only draws on her own career experience, but the National Forestry Service’s framework to triage and tackle forest fires, a methodology Simple actively employs. Whether you’re an early-stage company just beginning to build its brand or an incumbent under the watchful eye of billions, Berlincourt’s tips on how to proactively prepare and reactively respond to incidents will help you consistently manage and expertly douse any fires. When things are spiraling, don’t spin with them. Settle into an intense sense of calm, like the eye of a hurricane. Company crises — like wildfires — are complex developments that can progress in unexpected ways. In the heat of the moment, missteps in management can quickly result in a sullied brand and customer churn. Seek to inform, not alarm. They are incidents. The word "crisis" summons panic and paralysis, not clear, measured action. Flag early, flag often. Otherwise, what a bucket of water would’ve doused now takes 100 firefighters to fix. Thanks is the only answer — and last word. Berlincourt believes that brands, like people, are measured most during bad times. It’s during these depths when values are tested. The result is integrity. However, for many companies, those intangibles dissolve when disaster strikes. To make sure that doesn’t happen at Simple, Berlincourt and her team turn to Simple’s company values and incident management system (IMS) system to ensure their message remains on brand. The first tool in action is Simple’s IMS. “For any issue flagged by an internal system or someone at Simple, an alert is sent to a specific Slack channel. There are two classifications of alerts: technical and non-technical,” says Berlincourt. 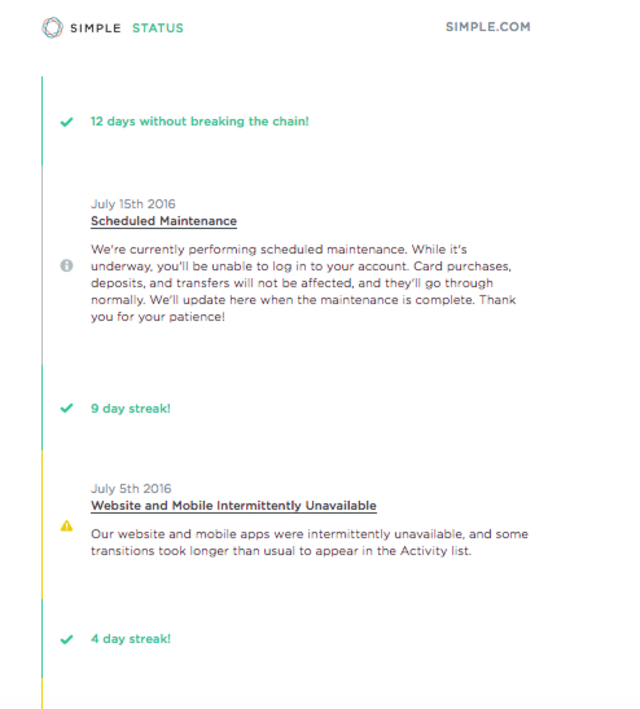 The status page also serves as a running log of past incidents. They are not swept under the carpet, but shown on a feed. 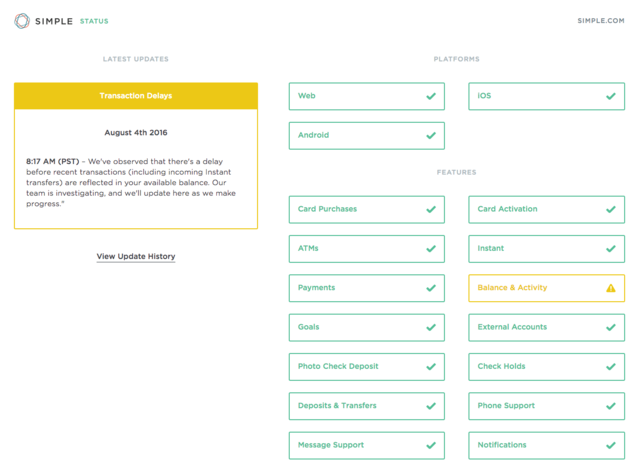 Any scheduled maintenance also appears here to alert Simple’s customers of any interruptions in service in advance. 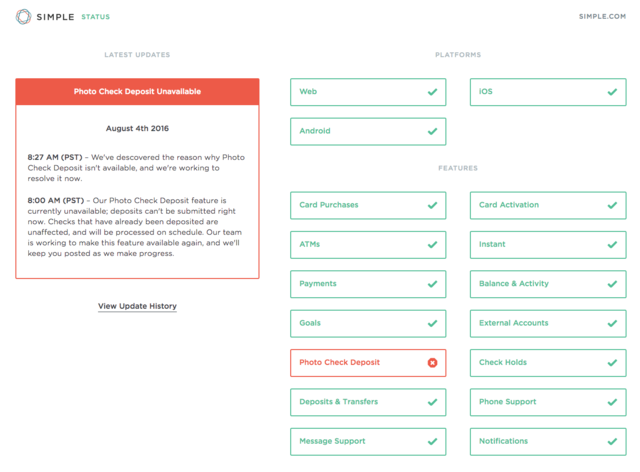 To gauge transparency, measure how able your customers are to self-serve during a crisis. 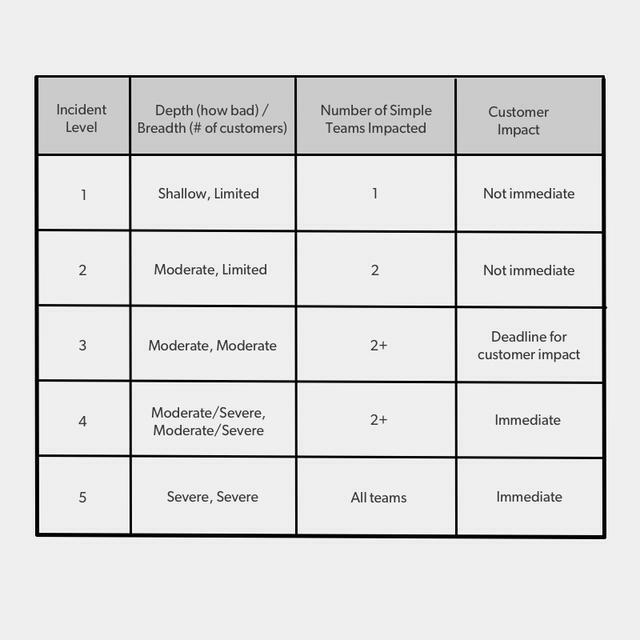 Triage the incident with four questions and a framework. Issue a statement based on what you know now. No fly zone list. “A no fly zone is like a safety-belt for empathy. Create a list of words during the best of times that you’d hate to see in a statement, then reference what’s off-limits to keep you on track when an incident hits. These generally fall into three categories — alarmist, careless and robotic — that, together, will help maintain an informed, friendly brand voice. For example, you’ll sound robotic if you’re hyper-formal, but could come off as careless or flippant if you lean toward too casual. One of the words I most hate is ‘oops.’ It’s becoming common for modern, conversational brands that try to sound playful and take the sting out of an incident. We make it a best practice to review incident messaging periodically and red line where we have room to grow. Close the loop with a learning review. Every incident needs closure. “We all share a belief in the importance of a growth mindset. We can always improve. That's not to say that you need to get better, but you can. We reinforce this concept in the naming of our process for closure. Rather than ‘post-mortem’ — which literally means an examination of a dead body to determine the cause of death — we use the term ‘learning review,’” says Berlincourt. “Just as we flag incidents, we encourage anyone in the organization to raise their hand and suggest a learning review. We’ll assemble a small team and run through the typical questions: What worked here? Where did we get caught up? Why did it take us so long? What would we do differently next time? How does our language stack up without the chaos of a time-crunch?" Wildfires, like company crises, are powerful but manageable with the right fire and escape routes. When Berlincourt joined Simple, the team was just over 20. Today, the company is over 300 employees. Customer account growth has increased by more than 40% over the last two quarters. The stakes are high and incidents must be met with empathy and exactitude — you can’t just throw up a fail whale in banking. To prepare for your company’s own inevitable “oh no” moments, learn to sidestep the seven sins of crisis communications. Create a culture where your colleagues can habitually flag incidents early and often. Seek to inform, not alarm. Once that culture is alive, overlay the tools to enable it. 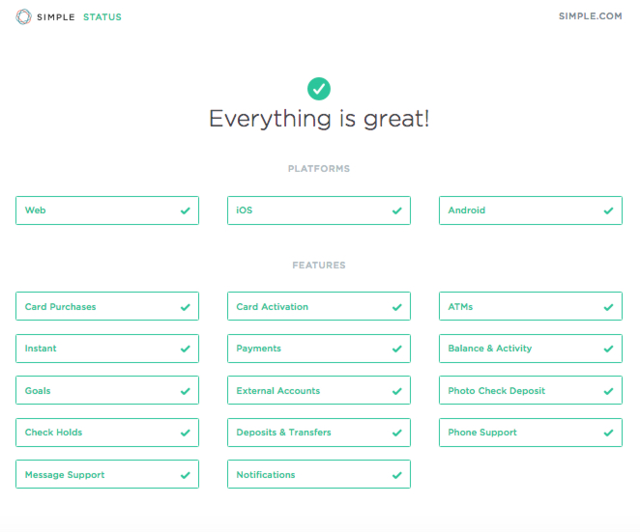 An honest status page, incident management system, risk classification framework, no fly zone lists and learning reviews are key tools — and all the more potent when synchronized as a system. This plan can help a lone firefighter build a process that empowers a team, even at scale.